Where are the best spots for Hawaii surfing vacations? That is a question we hear from many people planning to surf in Hawaii. For amateurs and experienced surfers alike, the Aloha State is the perfect place to learn or challenge well-honed skills. From gentle waves on Waikik beaches to the big surf on the Banzai Pipeline, each island provides unique surfing opportunities. No trip to Hawaii would be complete without experiencing surfing where it first began. All the islands have beaches with calmer waves suitable for beginners. If you are planning a vacation to Maui, the beaches on southern and western shores are great for first-timers. Launiupoko State Wayside Park and Kalama Park are ideal places to learn how to surf because their waves are not big. At Ukumehame Beach Park, you can find private and group surfing lessons. 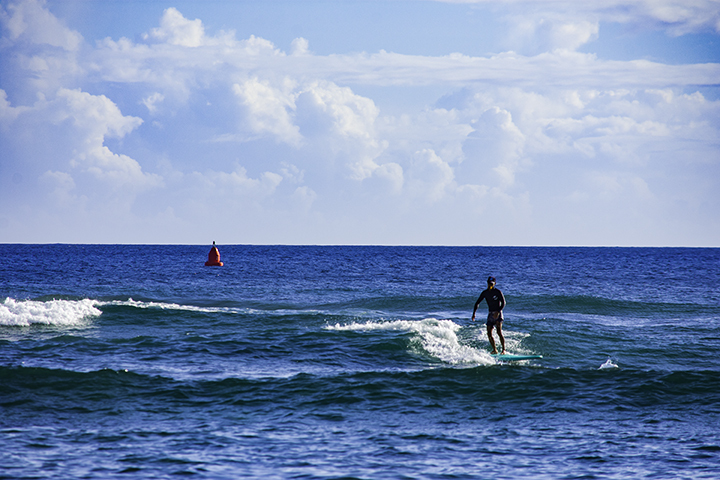 On Oahu, White Plains Beach and Waikiki Beach are good places to learn the sport. Pine Trees on the Big Island is a solid starting place for rookie surfers. While on Kauai, Hanalei Pier is a good beginners beach where a number of old-time surfing pros hold classes. Eager to paddle out on more challenging waters? If so, some of Hawaii’s prime surf locations are Waimea Bay and Sandy Beach on Oahu. Banzai Pipeline hosts the Billabong Pipeline Masters competition during each winter season. Here, the best surfers in the world congregate to tame the toughest waves. Pipeline has heavy sets crashing on a shallow reef, making it one of the most dangerous places to surf. This high-risk competition draws hundreds of spectators to Hawaii from all over the world. Sunset Beach and Haleiwa Beach Park are favorite locations. While Backdoor is also a well-reputed surf locale just on the other side of Pipeline. Kauai has been the training ground for some of the most skilled surfers in the world. Hanalei Bay has the most pleasant conditions of the islands with consistent waves perfect for surfers of every skill level. Other Kauai hot spots are Kalapaki Beach, Kealia Beach and Shipwreck Beach. Being the windiest island, Maui is the ideal location for windsurfing and kite-surfing. Kanaha Beach Park hosts the Maui Race Series each year. It is the longest running windsurfing race globally and is a must visit for windsurfing aficionados. Maui is also home to Peahi Jaws. With some of the deadliest waves in the world, it has unpredictable sets reaching up to 60 feet in December. As a result, first-timers to this place should definitely exercise caution. Hot spots include: Sandy Beach, White Plains Beach, Banzai Pipeline, Backdoor, Waimea Bay, Haleiwa Beach Park, Sunset Beach, Backyards, Waikiki Beach and Canoes. Check out Pine Trees and Kohala Lighthouse. We recommend Hanalei Bay, Kalapaki Beach, Kealia Beach, and Shipwreck Beach. Try either Hookipa Beach Park, Launiupoko State Wayside Park, Kalama Park, Honolua Bay or Peahi Jaws. For those who enjoy watching the pros tackle challenging waves, surfing competitions happen multiple times annually. These event are worth incorporating into your Hawaiian vacation. They say the only way to learn is to study the masters. And there is no place better to do that than Hawaii.